My image today was taken very quickly, I had little time and lots going on. After the paintball party Will had been at his best friend’s house for a sleepover and then most of today. When he got home all he wanted to do was chill out with an iPad and youtube tutorials of Minecraft. He had been playing in the woods, fishing in a creek, and so was extremely tired (and dirty!). He had a fab time. I love his hands, they are clever, and creative, and can build anything he wants. But what has always struck me in a rather sentimental way about them, is that they are exactly the same as my Nannan’s. The same shape, the same mannerisms, you name it. It’s funny how genetics are passed on and pop up in the most unexpected of places. Now she’s gone they are a constant reminder of her. The image was taken at 4:45pm in our gameroom at the front of the house. Little sun at this time of day, but it’s a lovely bright room. ISO 500, shutter speed 1/50, and aperture wide at f/1.4 to give shallow depth of field. Adjustments in Lightroom 4 were minimal. Slight increases to exposure, contrast, and clarity. Today we headed across the ‘Peace’ Bridge to take our visiting French exchange student to Niagara Falls, Canada. After sightseeing, we came across this funky little Volkswagen Bug. 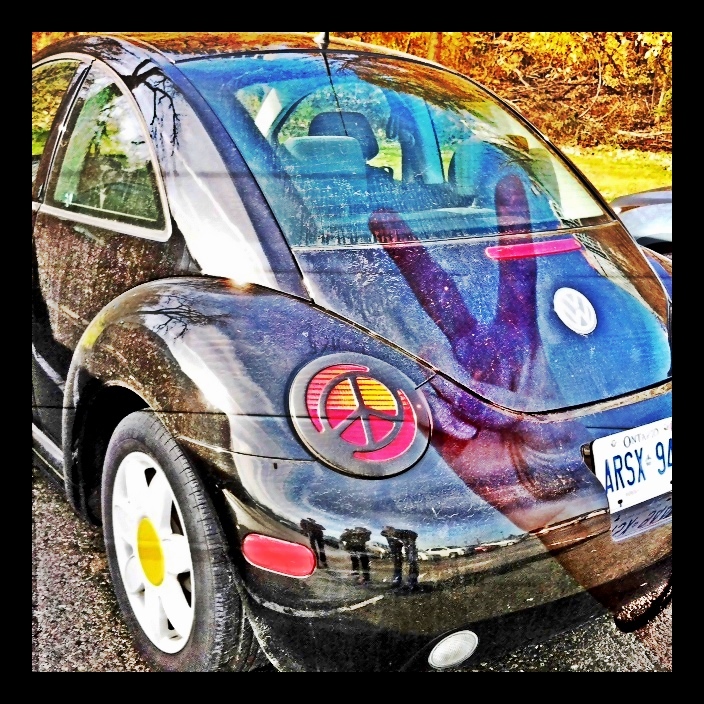 It was the daisy hubcaps that first caught my eye, and then I spotted the peace sign tail lights! I seriously thought I had died and gone to ‘hippie’ heaven. My son is crazy in love with VW bugs, so we had to stop and take a photo. The photo was taken at 11:00 am. It was very sunny and at the same time POURING rain with mist from the falls. This lent itself to the most amazing full rainbow. The iphone was a good choice of camera, since I had already tucked my DSLR into my bag to keep it dry! For the edit, I first cropped to a square and sharpened in Snapseed. I then used the Superimpose app and merged the two photos together using the transparency. I finished with changing the clarity, applying the HDR effect and framing in Camera+. I love the symbolism in this photo. The bright colors remind me of the beautiful rainbow arching over the falls. The peace signs remind of the Peace Bridge we travel across between Buffalo and Ontario, and also of the new friendship we have with our new French friend, Chloe Alizee. I love the picture of the groovy car! How creative to superimpose Libby’s peace sign!